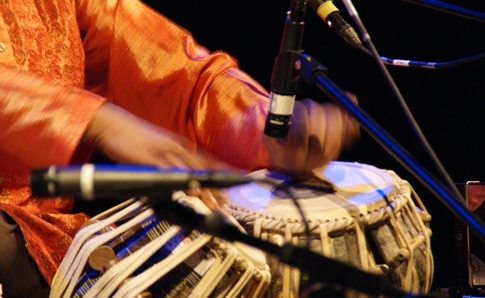 In Indian musical theory and practice the marking of musical metre by means of hand gestures (or alternatively by small cymbals or by drum-patterns), and hence, the metres so marked. Each taal pattern comprises a fixed number of equal beats, with claps and silent gestures asymmetrically disposed to facilitate time-keeping. The pattern is considered to be a cycle in which the first beat is the culmination of the previous cycle as well as the beginning of the next. The cycle is repeated as many times as necessary to complete the composition and any ensuing improvisation; change of taal in the course of an item is rare in concert music, but it can occur in pre-composed or non-classical music and dance.